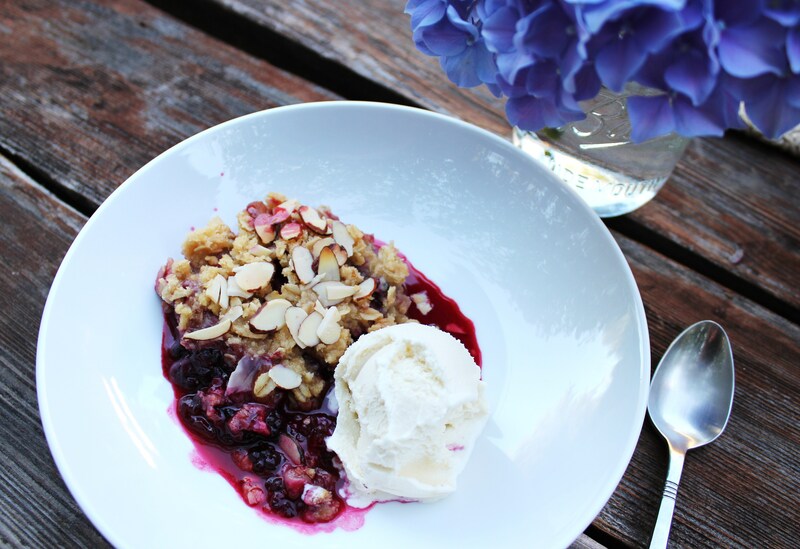 Summer is not complete without a morning spent picking blackberries. Last weekend, under the pressure of a fall-like chill in the air and the craziness of back to school time, the kids and I pushed out for a ramble along the creek. We brought the wagon, a gazillion containers, and a baby doll or two. We dressed in our jeans and forced socks and closed shoes onto our spoiled summer feet. We were ready for a real berry picking session. What we found however is that like all other summer fruits (tomatoes especially!) everything is super late this year. 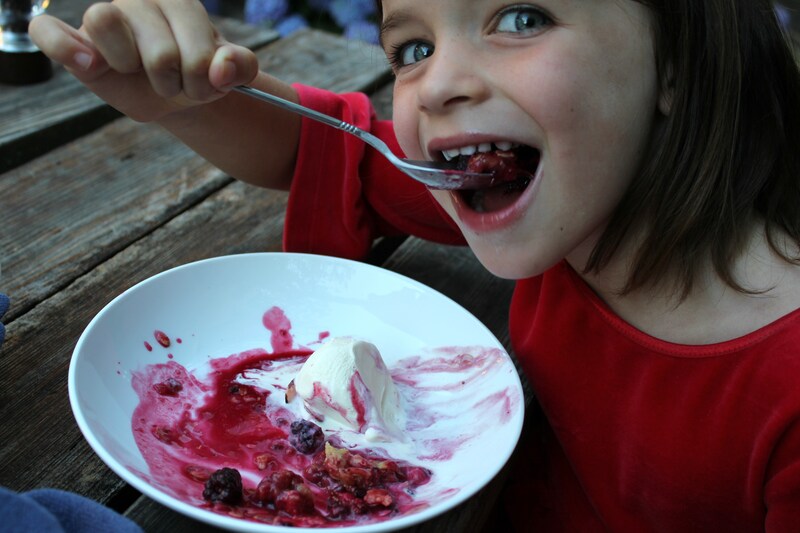 Not about to let a little thing like red under-ripe blackberries get us down, we assigned ourselves roles for our Blackberry Team. I picked the berries, my little man dumped the small containers into the bigger ones, and my little lady dragged the wagon up and down the trail laughing hysterically. After an hour of hard work (and just a few scrapes), we cruised home with a half-gallon of berries. Just enough for a few smoothies and Apple Blackberry Cake. While we suffer a shortage of ripe blackberries, we have boxes and boxes of Gravenstein apples from my parents’ trees. 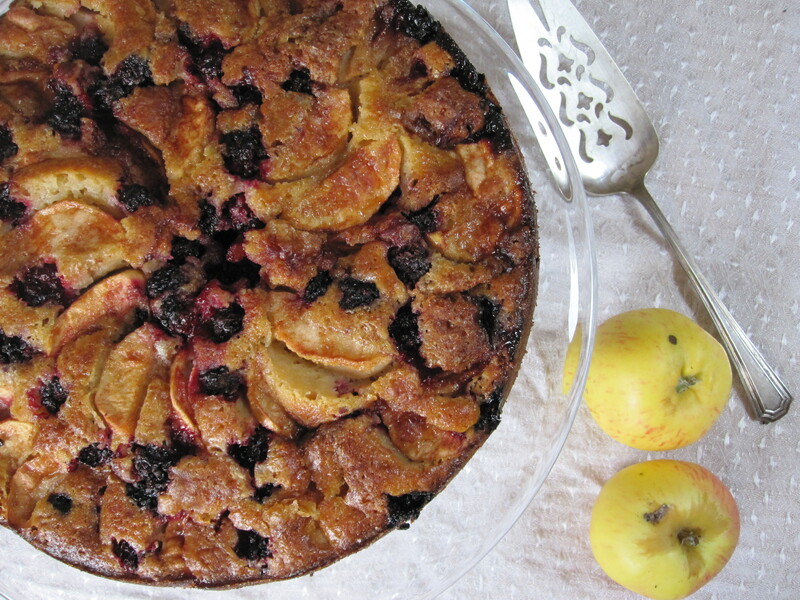 Apple Blackberry Cake is a treat to make each late summer or fall. Though it is simple to prepare, somehow the cake has the ability to pass as both an elegant special dessert and a casual weeknight treat. This time it even disguised itself as a birthday cake. 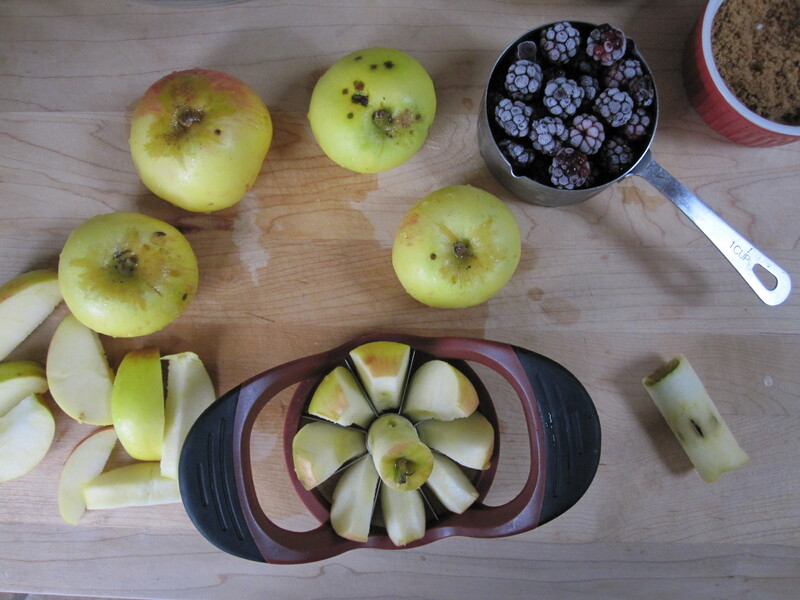 The apples are peeled and sliced and then pressed into a basic butter and brown sugar batter. 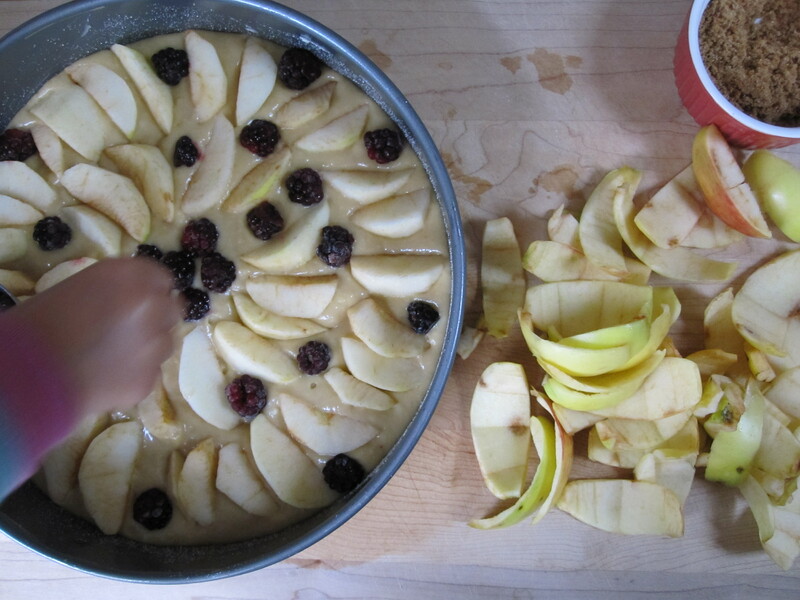 The blackberries scatter across the top lending both a colorful burst and a tart contrast to the apples. The sugar and cinnamon sprinkled over the top help to form a nice sweet crunchy topping. This cake is well matched with whipped cream or vanilla ice cream. I would not mind eating a slice for breakfast either with a nice cup of coffee. My family and I just returned from a delightful escape from reality in the Santa Cruz Mountains. Without the modern distractions of cars, phones, and computers, our days were peacefully filled with banana slug hunts, star gazing, and swimming until we pruned. It was a much needed pause in an otherwise busy life, a centering of sorts. But alas, there are other responsibilities to which we must tend. Some are grudgingly attended- bill paying, laundry folding, car repairing. Other responsibilities are the important rituals of life that help to make meaning and define some of the rhythms of our family life. 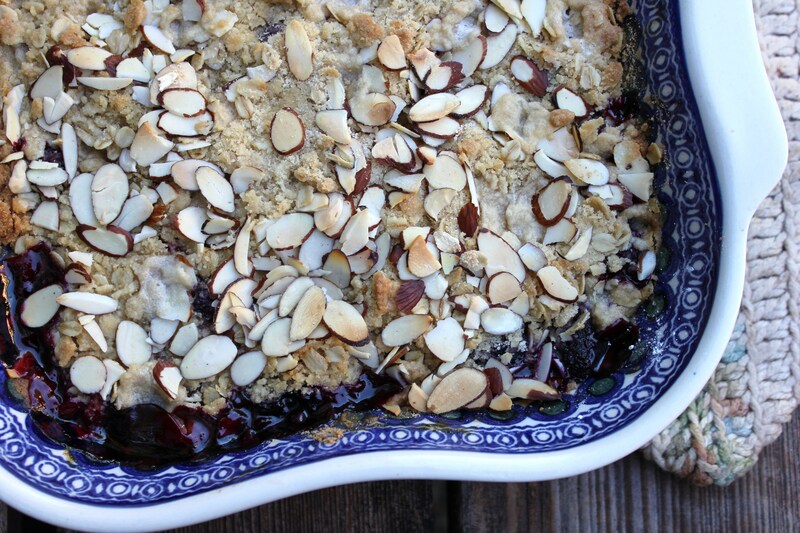 At the top of the list during this time of year is preserving the glorious bounty of summer. 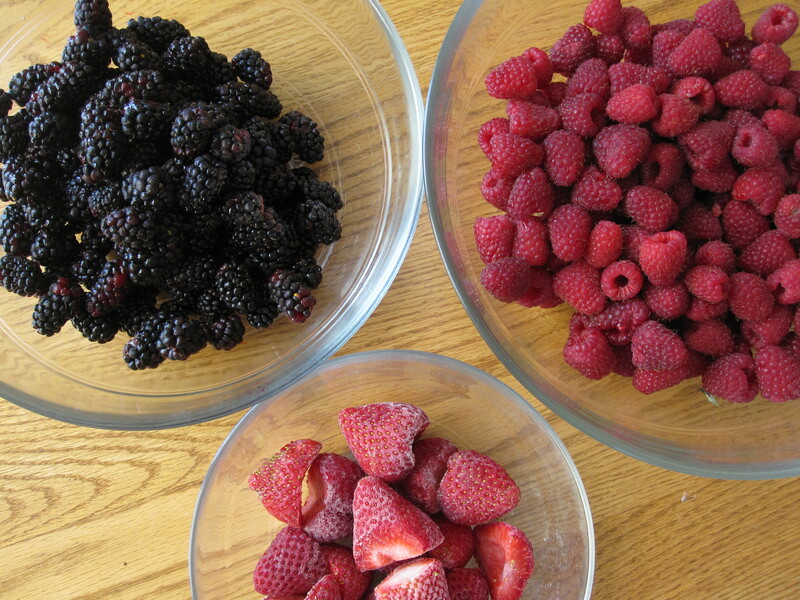 Berry season is short, so we rely on the craft of jam making to preserve these flavors for the dark days. On our way home, we stopped into Gizdich Ranch and picked up a flat each of raspberries and ollalie berries. 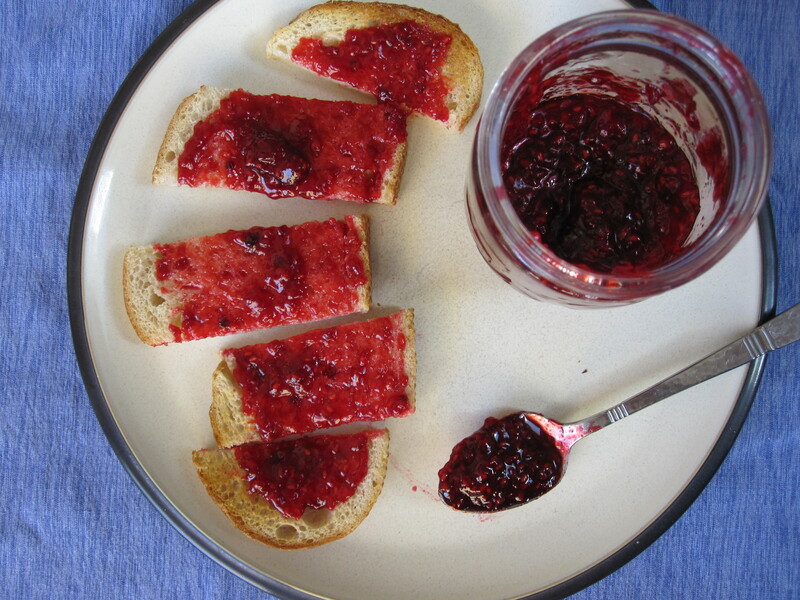 I combined these two berries with some strawberries I froze last month to create a mixed berry jam.